Greetings from a disgruntled Indian. I do not know how to address you. I do not know how many of you are there. I tried to find some information on your organizational hierarchy, but I am unable to do so. A WHOIS query done on your site has also not done much help, as your details have been hidden for reasons unknown. Why the secrecy? What are you hiding? 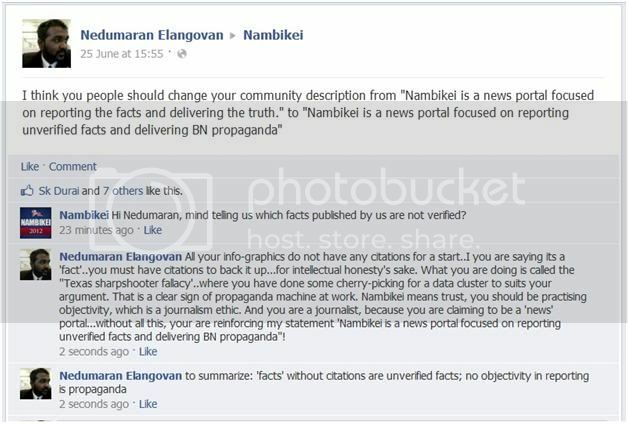 In your own words, you have said that “Nambikei is a news portal focused on reporting the facts and delivering the truth.” But by hiding your contact details, you look no better than a Nigerian 419 internet scammer. How can truth and facts be verified without its source being confirmed? A reader of this blog messaged me in FB on Saturday. This guy seems to be quite young, I guess not more than 20 years old. He is from a town in Negri Sembilan, and looking at his profile, his family seems to be the semi-rural middle income Indian family . Most likely, (with no disrespect) his parents are not professionals (in terms of career), and their main source of information is from the mainstream media. I don’t think that, they would have heard about the key issues that are being fought over by the government and the opposition, as these issues is never discussed in the mainstream media inflatable water slide. In any other case, this teen would have become the poster boy of the Pemuda/Putera groups. From rural Malaysia, brainwashed by the media and worshipping the ‘youth leaders’ who actually are balls carriers of the organization heads. Thanks to the internet though, this kid did see the world from a different point of view, and he did seek clarification when he didn’t understand. Below, I have summarized some issues that we don’t see the any pejuang bangsa 1Malaysia talking about. These are not the only issues, but these are key issues, that I have never seen any pro-Putera bloggers talking about. Who: Government Minister and family. What: Government give money (RM 250 million) for rearing of cows for meat, but they use for personal use, including paying for personal credit card, purchase of Mercedes and luxury apartments. How will it affect you: The money is tax you or your family members paid. Unggal appa ode kaasu, yevan-yevano enjoy pannelama?